Prepare onion-chili paste and keep aside. Heat oil in a pan or kadhai and temper mustard seeds. Add cloves, cinnamon and cumin seeds. Saute a while. Add onion-chili paste and fry for 2 mins. Add ginger-garlic paste and chopped vegetables. Saute a while. Add turmeric powder, garam masala and 3/4 cup milk. Add little salt and asofoetida. Cook till covered till the vegetables are cooked. Add remaining milk and salt if needed. Cook for another 5-10 mins and remove from the heat. Sprinkle pepper powder and serve with roti or rice. Kurma And Pulao, Good dinner Preethi! love this kurma without coconut!low fat recipe! Today I want to be your guest Preethi. Very nice and delicious combo dear…. fine with everything but is it ginger garlic paste? or onion chilly paste? 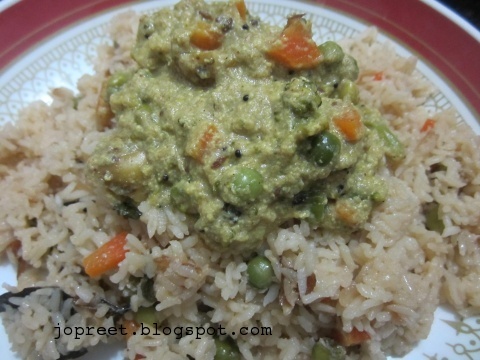 both the paste.. i just forgot to mention the ginger-garlic paste in the ingredients section.. i shall update it now..
Pulao and kurma looks perfect and delicious…. 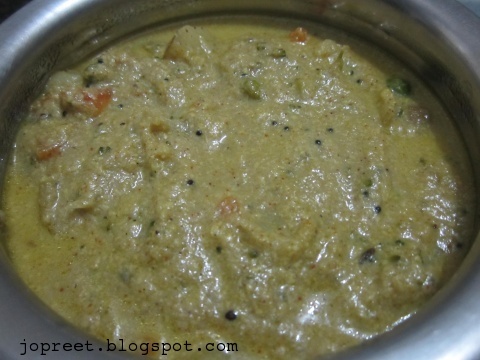 Nice korma..adding milk and grinding onion-green chilly are new to me..shall try it soon! i like to know the role of milk in the kurma. for the first time i am reading adding milk in kurma. priya, i have added milk to make this kurma thick.. you can add milk if you want to skip coconut..
Sweet! Can’t wait to try it!